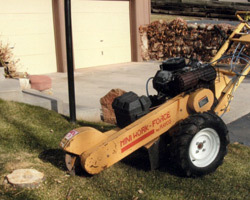 Stump grinders are a special and unique working machine. 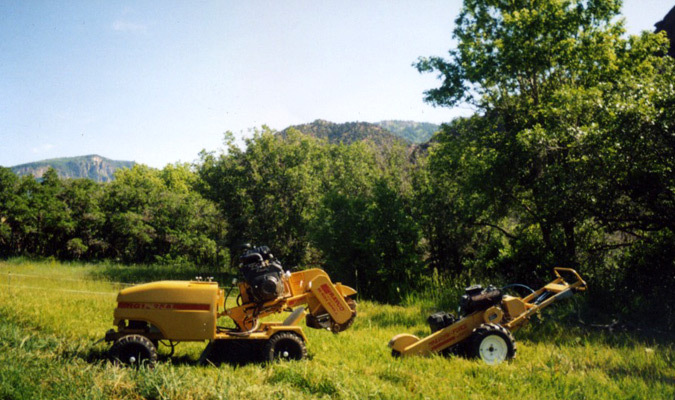 They are self propelled and are equipped with carbide teeth that are designed to remove stumps quickly and effectively. The machines are capable of fitting most gate systems, and offer low impact to surrounding ground floral. 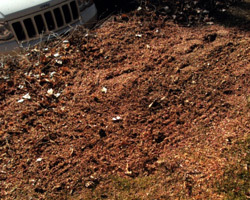 Stump grinding: Stump grinding will lower the stump mass approximately 4-6 inches below ground level. This will allow the top ground floral to regrow. HRTC will not be responsible for any damage caused to any underground wires / utilities / septic tanks etc. It is the owners responsibility to locate and disclose to us. If the stump has steel posts / rock / wire debris of any kind located in or near the stump that is not visible by HRTC personnel the stump grinding will cease and HRTC may charge for the attempted removal and the cost of the machinery teeth / grinders damaged by the debris. Please help us in keeping your cost down and protecting our employees and equipment. Root flare grinding: Root flare is the base of the trunk that flares outward from the tree trunk / stump. The flare of some tree species is large and may need to be removed to level ground / stump area. 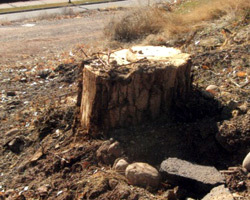 Root / gall grinding: The root system to a tree is massive and is not part of the stump or flare removal costs. If there are surface roots that are exposed they can be ground out as an additional cost.